Acrobat ants are medium-size ants ranging from 2.5 to 3.2 mm in length. Their bodies are shiny and can vary between red, brown and black. The most unique characteristic of the acrobat ant is their heart shaped abdomen, which they raise in the air like a scorpion when disturbed. Acrobat ants are native to Florida and can be found throughout the Southeastern United States. Acrobat ants are usually arboreal, living off the ground in places such as trees or shrubs. Acrobat ants are extremely territorial and only allow one colony per tree, however large colonies can be divided among many different trees. Acrobat ants prefer rotten and decaying wood to build nests. Acrobat ants also live in woodpiles, soil, leaf clippings and beneath rock piles. When acrobat ants build nests indoors, they are found in wooded areas with high moisture content. Acrobat ants also like to nest in foam materials and insulation. As with most ant species, the acrobat ant queen mates with a male during the swarm season. After mating, the male ant dies and the queen ant searches for a suitable nesting area. The first-born workers tend to the queen and care for the nest as she creates more eggs to strengthen the colony. Acrobat ants create castes based on physical abilities, size and age. Soldiers are larger and are more equip for defending the colony. Workers are small and care for the larva and offspring. Acrobat ants mostly feed on honeydew produced by aphids or mealybugs. The workers will also forage and hunt for live or dead insects. 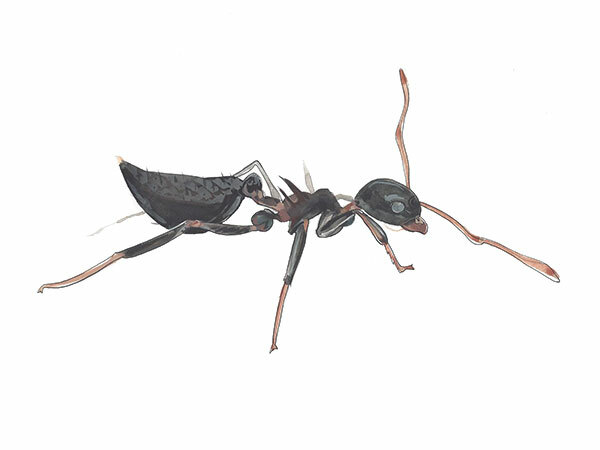 When indoors, acrobat ants like to feed on sweets such as sugar, honey and soft drinks. Acrobat ants frequently infest homes in locations with high moisture content. Eliminate rotten wood and prevent moisture buildup in and around the home for eradication and prevention. If acrobat ants are entering from outdoors, try sealing off cracks and use a residual insecticide along the exterior foundation. Spot treat voids, cracks and crevices indoors. If the ants are living inside a wall, inject an insecticide spray or dust with an aerosol can. Baits are rarely effective when treating for acrobat ants. Warning: Pesticide is poisonous and should be handled by a pest control professional. Always read the label and follow instructions before use. We have been providing pest control services to Sarasota and Manatee counties for decades, including ant control Gulf Gate, ant control Lido Key and nearby neighborhoods. We specialize in indoor ant control and getting rid of ants in the home. Call us today for a free inspection and quote.